HELLA develops a new range of LED daytime running lights for drivers with individual style and demand a high level of safety. 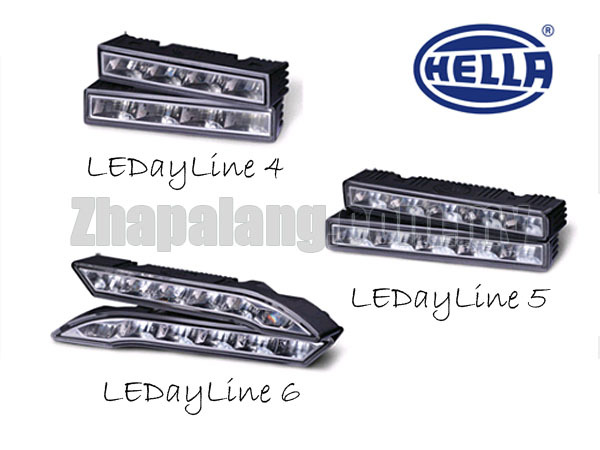 Available in three selections of 4, 5, or 6 LEDs, the stylish HELLA LEDayLine is suitable for many modern vehicle fronts and integrates seamlessly with your vehicle’s design. Powered by high intensity LEDs with a high colour temperature of 6700K, the brilliant white light of the HELLA LEDayLine allows your vehicle to be seen visibly even during the day. This makes your vehicle recognised earlier and better by other road users, giving them that decisive increase in reaction time. The slim design of the HELLA LEDayLine and its easy-fit clip-on brackets allows for easy retrofitting on most car models. After attaching the easy-fit bracket to the front of the vehicle, the daytime running light is simply “snapped” into the bracket. The HELLA LEDayLine is automatically switched on with the ignition and dims if the low beam is switched on. • High-impact resistance polycarbonate crystal clear lens. • Maintenance free with ultra long life LEDs.